Drinks and desserts will be provided. Join us for our first Information Technology Town Hall. This event aims at facilitating conversations about available and upcoming technologies on our campus. We invite you to come with your ideas and questions. Register online by September 19. This website offers an up-to-date report of the operational state of campus IT services at the University. 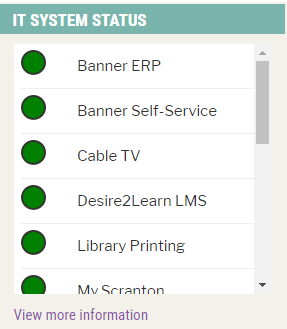 Visit and bookmark the website: status.scranton.edu. 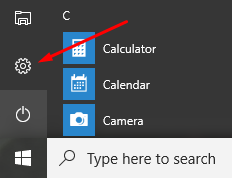 Windows 10 now gives us an easier way to locate old files that may be taking up vital hard drive space. Now you will be treated to a graphical representation of data storage on your hard drive. You can simply navigate to the different locations and select larger unnecessary files to delete. Windows 10 offers a great utility to assist in documenting tasks called the Steps Recorder. Go through the steps toperform your task. You can pause and resume the recording at any time. Select Save, name the .zip file, choose where to save it, and then select Save. Now you can attach and send this .zip file to others. It can be viewed in any web browser. Posted in Computer Tools, IT News, IT Training. Bookmark the permalink. Near Field Communication (NFC) has been a growing technology in the field of campus card technology for almost a decade, allowing more convenience with higher security. NFC cards use contactless technology that allows the cardholder to “tap” their card on a reader, rather than swipe their card, which we have become accustomed. Additionally, the card is more secure than the traditional magnetic stripe using higher standards of data encryption. For the last five years, the Division of Information Technology has been upgrading our Royal Card technology throughout campus to support NFC technology. We now have NFC technology on 84 door readers, 5 copier readers in the Library, 17 laundry readers in the residence halls, and NFC readers in each of the Fitness and Recreation Centers. With the increased ability to utilize the NFC technology across campus, we have begun issuing new Royal Cards with the NFC technology this year, starting with the incoming Freshmen class. We will continue to retain the magnetic stripe on our Royal Cards while we continue to support readers on campus that are not yet NFC capable. Over the next few years, we will continue to upgrade our campus hardware. This year we will be adding NFC technology to 23 more doors and to 6 point of sale devices in the DeNaples Center. By 2020, we will have NFC on all Royal Card devices on campus, which includes over 250 doors readers, 45 laundry readers, and 25 point of sale devices. When our campus is able to support NFC at all card reader locations, we will migrate from the magnetic stripe technology, to only supporting NFC card technology. The Office of the Registrar and Academic Services is pleased to announce the availability of online electronic transcript ordering for current students and alumni. This new feature allows users to order official transcripts via the Web at any time, 24/7. Official university transcripts for students who attended or graduated after 1992 can be delivered electronically in a .pdf format to designated recipients within an hour! Students enrolled prior to 1992 can order their transcript online, which significantly reduces the processing time. 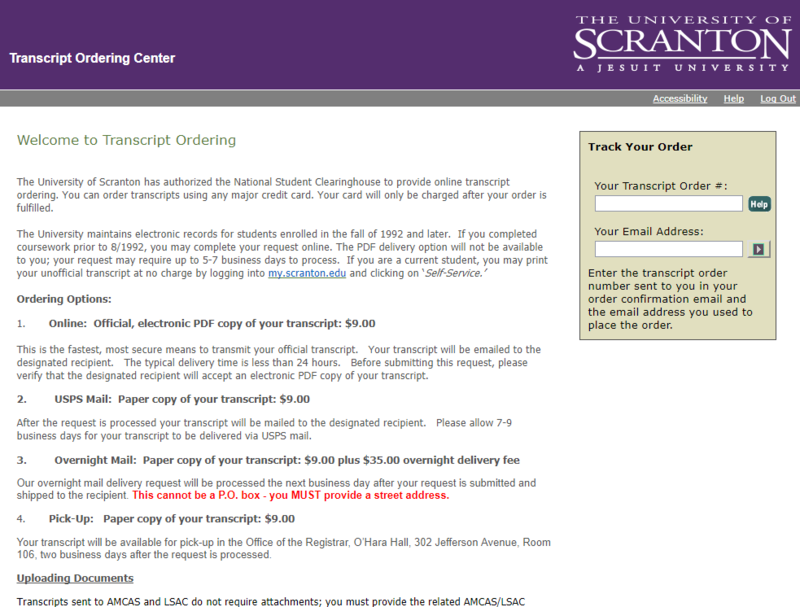 University of Scranton students and alumni can access transcript ordering by visiting the Registrar’s Transcript Requests website. There is a standard $9.00 fee associated with ordering a transcript. Questions? 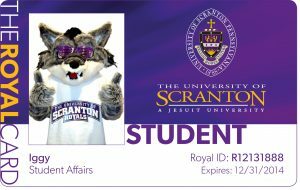 Email registrar@scranton.edu or visit the Office of the Registrar and Academic Services website. Academic and Media Services staff worked with faculty in the Engineering Department and mediated room 180 in the Loyola Science Center. Apple TV’s have been added to LSC 180 and HYL 102 for tetherless teaching. As we expand our virtual desktop program, we are pleased to provide faculty with the ability to utilize a virtual lab. The virtual lab provides access to a wide variety of University software from your own device. Students can utilize their own laptops to access standard applications allowing faculty to create a lab in any room that they are teaching. Two virtual lab offerings are available – Remote Desktop and Remote Apps. All lab and classroom Windows computers have been updated to Windows 10. In the lab and classroom environment, you will notice a simplified Windows 10 desktop. Shortcuts to browsers and File Explorer are available on the desktop and all programs can be accessed via the Start Menu. Windows 10 is also available for most faculty and staff computers as a self-service upgrade. For more information visit: http://www.scranton.edu/information-technology/services/windows-10.shtml. Posted in Classroom News. Bookmark the permalink. The desktop Windows operating system and many third party applications (Firefox, Flash, Java, Adobe Reader, etc.) received security patches over the summer. If you have not used your computer prior to these releases, they will automatically begin to download to your system when you turn it on. As the critical patches are installed, machines may experience a temporary decline in performance. The installations may take a little longer than normal, but they are critical to the health and performance of your machine and the campus network, so we appreciate your patience in taking the necessary time for them to complete. 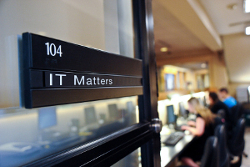 Many software applications have been upgraded in our computer lab facilities including Matlab, Maple, Mathematica, R for Windows, Crystal Ball and Panopto. In classrooms and lab locations, 91 new systems were installed and 82 other systems received hardware upgrades. Posted in Classroom News, Computer Tools, IT News. Bookmark the permalink. Through the spring and summer, the Academic and Media Services team has been working with the University Facilities Operations, specifically our electricians to transition the support of audio systems across campus. Starting this semester, the Academic and Media Services team will be managing the audio systems at special events. 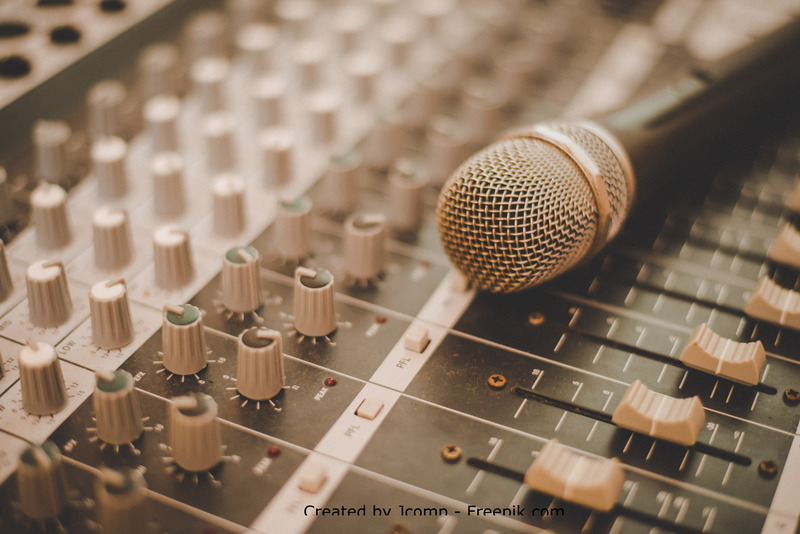 This new service encompasses consultation for special events, sound reinforcement, tuning the system to the venue, interfacing with electricians for power, coordinating with communications for press feeds and engineering the event from start to finish. This service will be available for all events that were previously requested through the University Electricians and the Physical Plant Work Order System in the my.scranton portal. Examples of these events are masses and religious celebrations, Commencement, Welcome events, Open House, Preview Days, Royal Days, groundbreakings, announcements, dedications and picnics. At the current time, offices needing assistance at these events can contact The Technology Support Center at 570-941-4357 or techsupport.scranton.edu.